Nifty opened flat but for the first time in many days saw the seller take control with a low below 6160 within the first few minutes of trade. The pullback towards 6190 was sold again and Nifty went on to touch the lows of the day around 6116 but a late pullback rally by the Bulls saw the index close at 6178.35, still a small loss of 24.45 points. The broader market was weak, with 652 advances to 698 declines. As per OI table 6300CE level is now having highest OI could be the resistance till expiry. 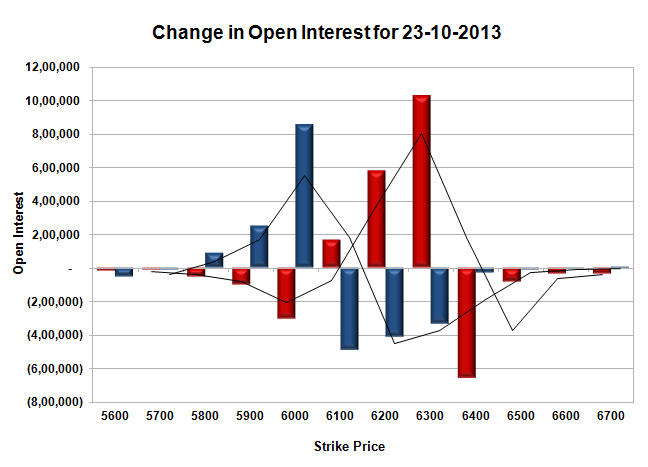 Call option 6100-6300 added 17.75 lacs huge amount of OI with short covering seen at 6000 and below strike prices. 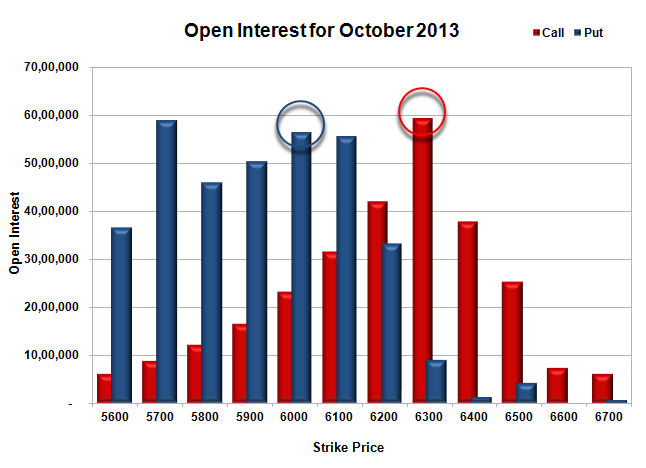 Put option 6000-5800 added 11.99 lacs huge amount of OI with short covering seen at 6100 and above strike prices. Nifty Open Interest is at 1,75,83,150 down by 7,03,150, whereas Nov Series added 6.83 lacs OI, with small decrease in price, most probably roll-over with small long liquidation. Bank Nifty Open Interest is at 18,58,500 up by 15,800, whereas Nov Series added 16.9 thousand with increase in price, most probably huge long build-up in both series. FII’s sold small 0.34 lacs Futures, mostly short build-up, as their net OI increased by 13011 contracts (includes 104371 longs and 105060 shorts) and the average price per contract comes to around 6108.85. FII’s future open contract as on date is 513813. 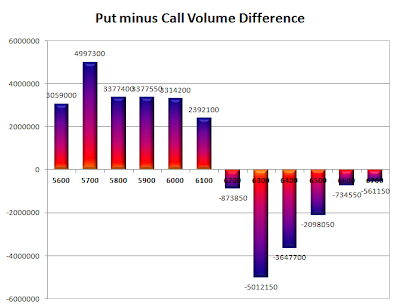 PCR Open Interest (Volume) has dipped again and now at 1.564. Initial support still at 6100, though covered a few, below that at 6000, with huge OI of 56.34 lacs. Initial Resistance now at 6200, though not very strong with OI of 42.05 lacs, above that at 6300 with highest OI of 59.26 lacs. Day Range as per Option Table is 6109 - 6237 and as per VIX is 6113 - 6244 with 6171 as the Pivot.